MixTech offers several short courses on mixing through the Department of Engineering Professional Development, University of Wisconsin, Madison. Take the mystery out of fluid mixing. Once you understand how and why mixers work, you will be able to correctly identify ways to improve your mixing. This course will get you moving immediately and in the right direction. The course format combines lectures, demonstrations, and problem-solving sessions. The course will address many different process applications in liquid mixing and how to translate results into larger equipment. You are encouraged to bring process development issues or situations you have encountered for discussion at the course. You will have an opportunity to discuss and explore innovative and practical solutions. The course wil include the processing methods for different types of dry powders, especially blending, agglomeration, and drying operations. The course will examine different types of equipment and establish the basic operating charateristics of each type. In addition to scheduled public courses, on-site courses are available through the Department of Engineering Professional Development, the University of Wisconsin, Madison. On-site courses save time and money and can be customized for your specific needs and applications. For more information about on-site courses contact the Program Director: Elaine Bower. 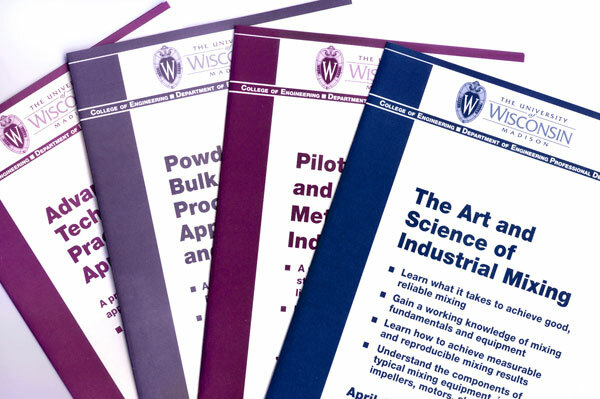 Call 800-462-0876, or e-mail bower@engr.wisc.edu.